I liked Xander Bogaerts before I ever saw him play. It was up in Portland last year. I was with my stepson and father-in-law. We had attended an autograph session for my stepson’s birthday. Each player had their own table. The most popular were Jackie Bradley, Jr. and Xander Bogaerts, who had just been called up to the Sea Dogs the week before. One autograph seeker, a 60-year-old “collector” tried to strike up a conversation with Xander and impress him with his baseball knowledge. If you have attended any of these sessions before, you know the type. They carry a binder full of signed baseball cards, each preserved in plastic to ensure their future value. Rising minor league stars are their primary targets. Well, this gentleman was looking to impress the Sox rising star with his baseball knowledge. “Fascinating,” said Xander without changing expression. On paper, this might sound rude. In person, you had to admire the 19-year-old who got what was going on and responded in a way that most of the people in line would have loved to. In short, you got the feeling this kid might be different. That was confirmed that night when we saw Xander play for the first time. First at-bat, home run. And it wasn’t that he hit a home run but they way he did it. The 19-year-old turned on a fastball like nobody I’ve seen since Jim Rice. At the start of this baseball season, I made a slap bet with my stepson that Xander would be up to Pawtucket by July 4. He took the bet mistakenly thinking I meant Boston Red Sox. Turns out, I wasn’t too far off. The kid made it to Pawtucket by June and was in Boston in August. Simply put, the kid is the real deal. What’s the networking pointer? Well, it’s not to be disrespectful to the people who help pay your salary (as much as I thought the comment was fitting). But it does have to do with being genuine in your elevator pitches. Don’t overpromise. Don’t exaggerate your capabilities or try to impress for the sake of impressing. Be real. Be who you are. People will see that and respond accordingly. One of the bigger laments you hear from small business owners stems from a lack of time for tasks like updating websites, publishing an e-newsletter and posting to their respective business’s social media sites. While the first two items do take a distinct amount of effort, even the busiest people have time to join the social media conversation. It’s as simple as looking just above the banner of this e-newsletter. Nowadays, most e-newsletters and websites have social media icons that enable you to share with a click of your mouse. So, if you stumble upon an article that you find provocative or topical, you can post to your Facebook, Twitter or LinkedIn account just like that. One of the great things yours truly has discovered lately is that by clicking on the LinkedIn button in a Constant Contact newsletter, you can not only post as an update to your profile, but send to the groups of your choosing. Of course, it does require some thought as to what you want to post and the comment you want to make with it or the discussion you want to start. Still, how many times a day do you come across something of interest that you would like to pass on? Or, let me rephrase that, how often do you come across something you could pass on? Social media is about being out there. This is just one tactic to making it easier for you to do that. Can I add you to my e-newsletter mailing list? This rather simple request received rave reviews from most who commented. One group member, however, accused me of social media extortion (“How dare you make being on your mailing list a condition of connecting!”). Overall, the rest of the discussion group thought it was a great idea. But it did get it did get me thinking. How many of you who use LinkedIn actually reach out to the people you connect with? If the answer to that is, “not at all” or “not as often as I’d like”, an e-newsletter is the perfect vehicle. How so? First, it starts a conversation with your new connection. Even if the answer is no (e.g. I can understand why you wouldn’t want to be on yet another e-mail list…). Second, it does give you an idea of your new connection’s interest in truly networking, particularly if there is no response. The idea of networking is to develop a relationship with another person so that you can pass leads or referrals down the road. 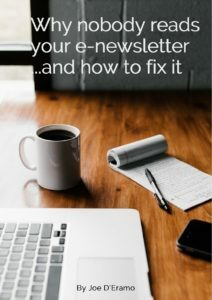 An e-newsletter, in addition to your website, gives new connections a way to get to know you and your business. If receiving your e-newsletter is an imposition, it’s probably not likely that person is going to be terribly active in passing leads or referrals to you. The real beauty of this strategy is that it’s a two-way street. If the new connection is okay with being on my list, I have no problem being on theirs. And that can be the springboard to vested networking and lead/referral generation. Does this work? It really does depend on the people involved. There are serial connectors out there who seem to be far more interested in bragging about the number of connections rather than actual networking. But if you’re on LinkedIn and getting little more than a “thank you” for the connect, you may want to consider this approach as a concise way to start a conversation and talk about what’s going on with your business. If you do not have an e-newsletter, we can help. For a free estimate on what it would take to start your own e-newsletter, please give me a call at 617-848-0848 or drop me an e-mail. Better yet, take advantage of Constant Contact’s free 60-day trial.